Find pet blankets, bird feeders, pet toys and more all with fantastic reductions in the pet, bird and Wildlife clearance section. Where do I use my Selections voucher code? 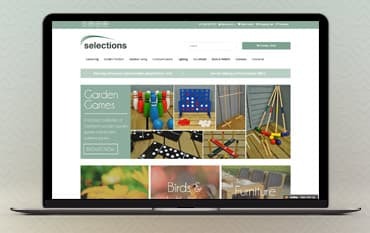 Shop online at selections and find a huge selection of gardening products like archers, obelisks, baskets, trugs, harvesting products, garden composting, garden kneeler pads and seats, gloves, aprons, hand tools, greenhouses and polytunnels, gutter protection and cleaning products, home brewing, lawn care, edging and rollers. As well as pest and slug control, plant frost protection, plant propagation, pond maintenance and care, screening and fencing, track and trolleys, trellis and plant support and watering and irrigation. If you’re looking for outdoor living products you can find artificial plants, fire pits and barbecues, garden furniture sets, clocks, mirrors, tables and chairs, storage items, wall art, water features and even hiking and camping accessories. As well as all this at Selections, you can find a selection of furniture covers, all kinds of lighting and even bird and wildlife products. You can also discover tons of household products like boot stands, doorstops, buckets, bins, decorations, ornaments, games, DIY tools, doorbells and door knockers, kitchen items, fires and heaters, jewellery, laundry products, log carriers and storage, hooks and hangers and security equipment. As well as a huge array of gardening and household products, Selections also provides seasonal products for specific times of the year like Halloween and Christmas. Each year the seasonal Christmas range at Selections expands, with a carefully curated collection of festive must-haves like decorations, garlands, wreaths, baubles, lighting, storage bags, doormats, advent calendars, candle bridges, LED tapestries, artificial Christmas trees, gift wrap and tableware. If you’re shopping for Halloween you can also find a huge selection of products to compliment your spooky celebrations. Discover two sizes of cauldrons, Besom broomsticks, battery operated lights and decorations, all designed to create an exciting Halloween atmosphere. If you’re looking to spruce up your garden or home with furniture, plants, accessories, lighting, planters or anything else, you can find a huge selection of top quality items at Selections. With so much to choose from, shopping can be overwhelming, and with costly price tags and so much to buy, sometimes your bill can add up. Selections know this and so do all they can to keep costs down. They also provide a great clearance section with tons of products that allows you to save on everything from furniture to birds and wildlife products. Shop for Christmas products, home and garden products, garden furniture, lighting and even household items and enjoy incredible savings on it all in the clearance. Selections are extremely passionate about gardening which is why they offer a huge array of quality gardening and homeware products at sensible prices. The Selections team works tirelessly with key suppliers to design and source innovative products that true gardeners with love. And with a vast array of gardening items available like planters, outdoor living furniture, furniture covers, lighting and bird and wildlife products, you can find all you need for your home and garden for an affordable price. And, if you pair these already affordable items with a discount code from us, you can enjoy even bigger savings on your garden supplies too.